It really doesn't matter what your goals are. 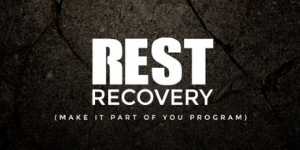 Sleep, Rest and Recovery are Essential. Either you're looking to lose body fat, or increase your performance, all will affected if your body doesn't rest. Building recovery time into any training program is important because this is the time that the body adapts to the stress of exercise and the real training effect takes place. Recovery also allows the body to replenish energy stores and repair damaged tissues. During undisturbed sleep, the plasma growth hormone (human growth hormone – somatropin) is found to be at its highest levels. If the sleep stage process is interrupted, complete repair of soft tissues is impossible due to the resulting decrease or absence of said human growth hormone. It is key that you do everything possible to ensure a good night’s sleep is had. Stick to a sleep schedule of the same bedtime and wake up time, even on the weekends. Consume a healthy and balanced diet, drinking plenty of fluids throughout the day. Avoid long daytime naps. Limit yourself to up to 30 minutes and avoid doing it so late in the evening. Exercise daily. Regular physical activity can promote better sleep. Avoid being active too close to bedtime, however. Free your bedroom from any light. It is highly suggested to cut off your browsing time at least thirty minutes before bedtime to relax your brain. When you're relaxed, your brain will be able to release the hormones you need to have relaxing sleep. Manage Worries. Anything that is playing on your mind, write it down and address the problem in the morning.